This article is going to describe how to create a database table from database using hibernate. A hibernate is an object relational mapping (ORM) tool, that is used to manipulate database tables as class and their object. 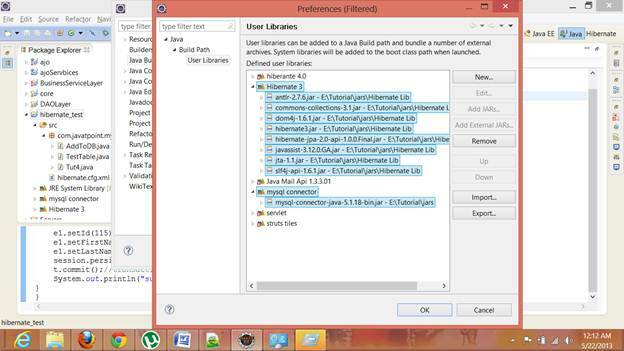 We are using hibernate 3.6 version to create a database table. A Hibernate is an object relational tool for database used in java to provide the accessibility of database contents using objects. <?xml version='1.0' encoding='utf-8'?> : This is the first tag of hibernate.cfg file that describe the xml version and encoding format for the xml file. This tag is the xml document type tag, which provides the required information about the document or hibernate configuration xml file. <hibernate-configuration> : This is next and parent tag for the hibernate configuration. It is the base tag, containg all the hibernate configuration setting in its sub tags. <session-factory> : This is sub tag of <hibernate-configuration> that hold all the required properties to communicate with the database, like database connection setting url, usernate, password and etc. This property defines the database connection string, which is database specific. This property defines the database connection url. This property defines the database user name. This property defines the database password. This property informs the hibernate about the used database so that hibernate could database specific queries automatically. This property tells the hibernate, whether there is a cache provider or not. This property informs the hibernate to print all the executing queries on to the console. 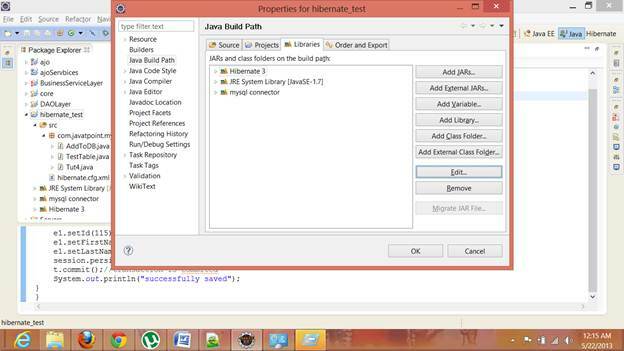 This property tell the hibernate to create or update database schema, while executing. This tag inform the hibernate, which class is to be treated as database or entity class. In the mapping tag of the hibernate.cfg file, TestTable was defined in the class attribute that represent a pojo class class, being referred to the database table. The TestTale.Java File : This file defines a pojo class that is bean class having setter and getter methods for defines class variables. The class name is being referred to the database table sometimes and class variable name can be referred to the database attribute names respectively. But these names can be altered as user defined using annotations and their properties. To define a class as database table name, @Entity annotation has to write before the class declaration that tell the hibernate to use this class database entity class. 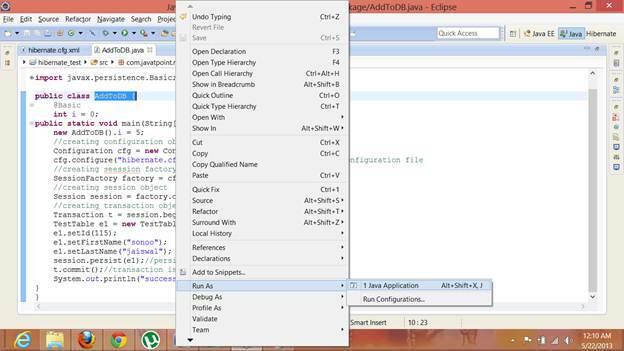 This annotation was defined in the class name javax.persistance.Entity class. To define a primary key in the hibernate, annotation name @Id need to place before the class variable declaration. We can also place the @Id and @Column annotation before the getter methods instead of class variable declaration. Create a session factory object that should be created for once for an application. Create a session object from session factory object, this is request specific. 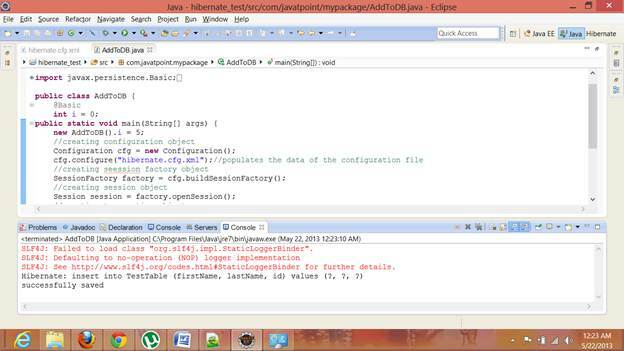 Create a pojo class object and assign data using setter methods. Create Hibernate connection class to communicate with database.